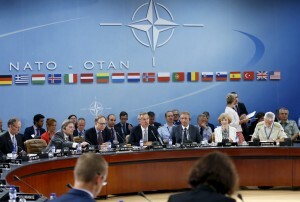 At a rare emergency meeting in Brussels, NATO members offered support for Turkey’s campaign against militants in Syria and Iraq, but cautioned the country against using undue military force. Turkey requested the meeting after increased attacks and threats of attacks in parts of southern Turkey along the border with Syria. In one recent incident, militants killed 32 Turkish citizens in the town of Suruc. Turkey recently struck a deal with the United States to try to push Islamic State fighters back from the Turkish/Syrian border. Under the deal, American fighter aircraft can be launched from the Turkish base at Incirlik, and Turkey will take on an increased role in the fight. Some are saying the deal with the United States has allowed Turkey to increase its military operations against militant Kurdish forces fighting for their independence. Complicating matters, the United States is relying on Kurdish forces in Iraq and Syria to help battle the Islamic State jihadists in those regions. Kurdish forces have been able to retake the strategic towns of Tal Abyad and Kobani. However, Turkey is worried these victories will motivate the Kurds inside its borders to further push for independence. According to the BBC, Turkey has insisted that the Syrian Kurds are “outside the scope of current military effort.” Turkey also has stated that the peace process with Kurdish militants could continue, if the “terrorist elements” put down their weapons and left the country.